You cannot mine for truth in a quarry of lies. Likewise, you cannot search for an authentic Scotch egg recipe on Google. Even articles from reputable sources like the BBC and Allrecipes.com are wormy with deceit, indicating that mere boiling, wrapping, and frying exercises are all you need to make a Scotch egg. Do not be fooled. A real Scotch egg can only be found through questing, and the journey is not for the faint of heart. A long time ago, on a night like this, my babysitter told me how to seek the egg. Should you think yourself brave, you must set out for the darkest part of the forest with nothing but a case of cheap beer, the collector’s set of American Pie movies, and a small pouch full of Sacajawea dollars, the most unpopular coin in America’s history. In the forest, you will find a bare breasted bro* living in a tree trunk. Midway through his M.B.A. program, this bro partied a little too hard one Thursday night and lost a series of bets that led to his eternal banishment. He owns one baseball cap and lost his t-shirt months ago after trying to wash it in the creek. All he can do for entertainment is bulk up and watch sports on his iPhone. Be kind to him. The journeyer must present the American Pie movies and beer as an offering. After accepting the gift, the bro will immediately want to have a drinking contest, but you must resist no matter how goofy he is or how much fun he promises getting hammered in the forest will be. One must retain all their wits for the next part of the journey. Politely refuse, promising him you can do it another night. Should you prove successful in your offering and bro-conversation, you will be granted the location of the magical farm. Don’t let him follow you. Night falls as you approach the farmhouse, which appears to be abandoned. You knock on the door and hear no answer….you try the handle….it’s unlocked. With silence in the pit of your stomach, you enter the house and find, illuminated by soft yellow light, a gleaming basket of Scotch eggs on the counter. Be careful. Do not act foolishly in your egg lust. It’s the Scotch Egg Monster protecting its litter! Throw a handful of Sacajawea dollars at the beast, grab the basket of eggs and RUN. Do not stop. Run past the bro in the tree and throw an egg at him. He needs the protein. Keep running until you are home in bed. You are… not only unique, but uniquely unique, and you are also the only one who doesn’t make that description redundant – which is another reason why you are uniquely unique yet again, but still never redundantly redundant. The dimension from which I came will remain a secret until my kind take over the universe, at which point you will already be one of us and know the truth. It’s going to be weird. Thanks for reading!!!!!!!!! Exclamation point! HAHAHAHA! You are freaking awesome. That is all. No, the Scotch egg is awesome. She is my muse. My husband made these for me the other day, but had I really known all the effort he went to to make them, I would have done a lot more than just thanked him. He sacrificed Sacajawea coins for you! You should have thanked him AND given him a high five. got me interested… but where is the link to authentic recipe?? See my most recent post—I caved in and provided real information. I also have the Scotch egg hunger now. Tell me about it. The more I talk of the egg, the more I want one, but pork sausage is not to be found in Cairo. Then you need to come to America, where pork sausage can be eaten to your hearts content, with the freedom that you deserve. 🙂 I’m surrounded by apple smoked bacon, and pork sausage. Wish I could send you some, but it probably would not make it past customs. ohhhhhhh the pain. I’ve got 2 more months here and then it’s off to the land where swine can be eaten forever and freely. There’s a restaurant in Oklahoma City that has bacon in every dish, as it should be. I watched a lot of late night television as a kid. This is one of the funniest clever blogs I have read in a long time. I do think you are wrong about one thing… The Susan B. Anthony has to be the most unpopular coin… at least Saca was better looking! Oh No! I just read English Cooking, Part 1… serves me right for reading ‘out of order’, as I see you intend to ‘Mock’ anyone disagreeing with you. Please know, that if there is to be a Part 3, I will agree with everything you say. You have appeased me…….for now. On a side note, I spent a little time in Ecuador, which uses the American dollar, and apparently all of our gold coins were sent there because they were all over the place, whereas people don’t even believe they’re money in some parts of the states. Wow… that’s interesting. They certainly weren’t a big hit here. Or those President’s Coins. At the State Ferry Toll Booths, they give out change in 50cent pieces… when is the last time you’ve seen one of those? Well, I guess a long time… not too many in Egypt I would expect. I agree with Blitz… time for you to come back to the states. GAH!!! I should have known. I’ve spent so many nights in the forest, so close to victory, sopped only by my inability to refuse a cheap-beer drinking contest. Oh, when will the cycle of horror end so I can find my one true scotch egg?!? Guapo, you must resist. Be better than yourself! I’m up for the quest. 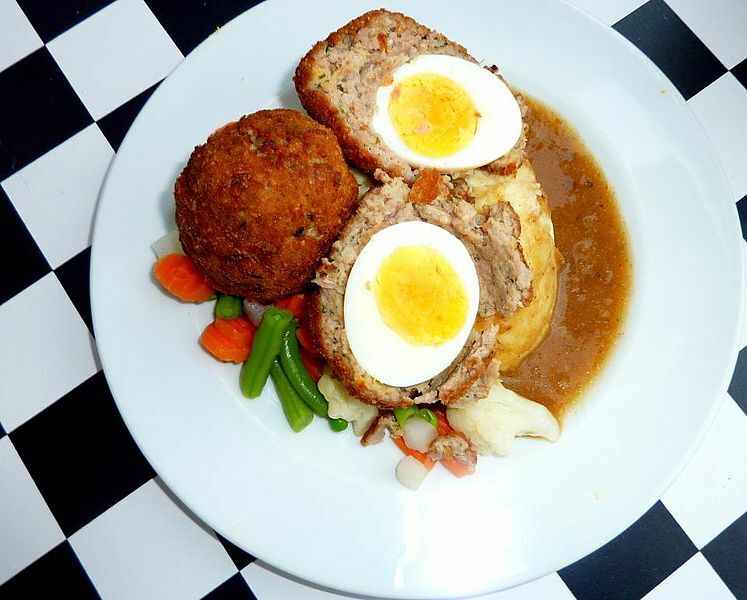 The Scotch Egg Monster can be subdued with 16oz of moderately priced Scotch whiskey (They’re notoriously partial to the beverage) and an autographed picture of Tiger Woods (They’re golf groupies). It seems you’ve done your homework. May God give you speed on the journey.